Tommy Peoples, a St Johnston man, is a famous traditional musician and composer. He was a member of Irish Music group 1691 and the Bothy Band. He has been performing solo as well since the latter 1960's. His fiddling skills are phenomenal. He went to live in Dublin in the sixties to take up employment as a member of the Garda Siochana. After that he made his home in Clare. He subsequently married Mary Linnane. Their daughter Siobhan is also a fiddler of outstanding talent. Famous groups such as Altan and Lunasa have recorded some of his compositions. The Balor Arts Centre in Ballybofey has appointed Tommy Traditional Musician in Residence. In 2012, Tommy was granted the honour of being elected a member of Aosdána during its General Assembly at the Royal Hospital Kilmainham Dublin. Aosdána is a body for creative artists whose work is distinguished, original and groundbreaking. 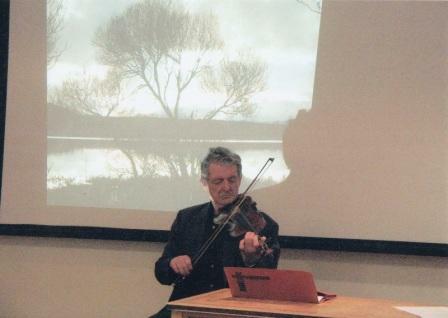 Hundreds of friends, family and traditional music followers have attended the funeral of master fiddle player Tommy Peoples from Co Donegal who died on Saturday, aged 70. Chief celebrant Fr Joe McMahon said that Tommy was always special, his playing complex, strange and almost otherworldly at times. Born in St Johnston in east Donegal he spent 30 years living in Co Clare, a county whose people and music he loved dearly. Paddy Glackin, fiddle player and friend, described Tommy's composing of many tunes as prolific and said he scaled new musical heights. He said Tommy had taken us all on an exotic and at times dangerous but beautiful musical journey. Among the gifts brought to the altar were the two Gradam Ceoil awards presented to him by TG4 for Musician of the Year 1998 and later for his music composition. Tommy Peoples was buried in Drumcliffe cemetery just north of Ennis beside his son, Tommy Óg who predeceased him aged 21.